Bike Race Free APK 6.6 is one of popular arcade games you should try. This simple game is very challenging for those who like puzzle arcade type. This game simply uses accelerometer from your android device to control every movements of the bike. You will pass over 32 tracks which have different level of difficulty. Control the tilt and acceleration of your bike are the two most important keys to get your victory. Grab three stars each level by giving the best performance and enjoy the feeling. This game is better to play in small to medium android screen than tablet, because it will be easier to control your bike. You are capable of changing the bike with stronger abilities in the next level. There are two options of the game; single player and multiplayer mode. 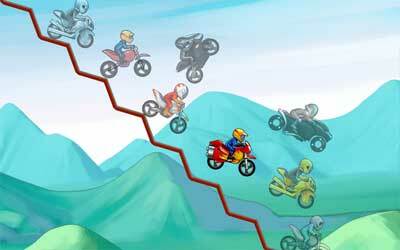 In single mode, you will run your bike without rivals. On the other hand, multiplayer mode represents view rivals that will compete with you; 8 to 40 players. Your combo bikes can be used in single mode and multiplayer mode. This game shows the cartoony picture and do not play in detail. But, it runs well without any meaningful bug. The setting of the place is not changing, while the camera is following bike movements. This game is produced by Top Free Games and only available on English. For having this arcade, your android smartphone should have at least android 2.3 as the operating system. Well, there is nothing perfect in this world, including this game. Don’t be afraid of wasting your storage, this game just needs small space in your device. Since its small size, there are still many lacks in it. But, the producer will give you the upgrade, so it will getting better from time to time. Overall, Bike Race Free for Android is fun game to try.